This quick and tasty dish made of fresh tender greens and beets can be served for breakfast, lunch or dinner. Use your favorite method to cook beets - boil in water, bake, or microwave to cut cooking time to 12-15 minutes. Use fresh ginger, not the ground variety - it will add a little bite to this healthy and nutritious dish. Cut greens with stems off beets, leaving about 1 inch of stalk on beets. Wash the greens and the beets thoroughly to remove dirt and sand. You don't need to dry beet greens - they can be sautéed with water clinging to their leaves. To cook beets, place them in large saucepan, cover with cold water, and bring to a boil. Reduce heat and simmer until beets are tender when pierced with knife, 30-45 minutes, depending on size. 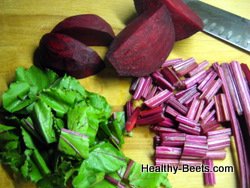 While the beets are cooking, cut the stems from beet greens and chop them in 1-inch pieces. Chop greens into fork-size piece separately. Tender greens require less cooking time and should be added to the skillet when the stems are almost done. Once the beets are done, drain them and rinse with cold water. Sleep the skins when the beets have cooled enough to handle. Cut beets in slices. In a large skillet, melt butter. Add stems and sauté until tender, 4-5 minutes. Add greens and sauté until bright green and just tender for another 3-5 minutes. Add sliced beets and heat through. Peel and mince ginger root, mix with lemon juice and honey, if desired, stir into cooked beets and greens. Serve immediately. For a special, rich flavor try using ghee (clarified butter) instead of regular butter. It doesn't burn or smoke as easily, and is considered to have healing properties not found in other saturated fats. One tablespoon is sufficient for this recipe.